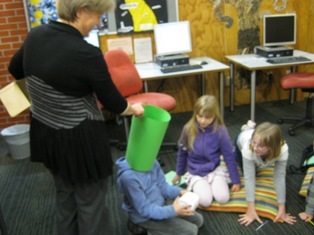 It was the last session for the Johnsonville Bookseekers this month but we had a great time looking at our new Kids On-line Book Club. If you write and submit your reviews on our On-line Review page you can earn points towards winning prizes. We have had lots of kid’s submit reviews already and as well as writing your own reviews you can comment on what other kids have been reading. Thanks for all the reviews that you shared with us today and it will be great to see you write them up and to start earning prizes – so what are you waiting for – get writing! 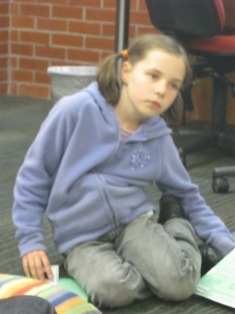 Thanks for all your great reviews Tawa Bookseekers. You have been reading some awesome books lately and we look forward to seeing you write these up on our new Kids On-line Book Club. By submitting your reviews on our Book Club Review page you can earn yourself points towards winning some prizes. You only have to do two reviews to earn your first prize. 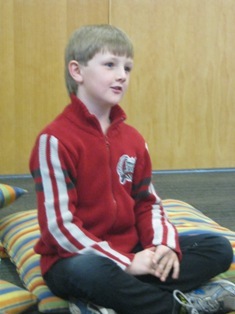 It was great to see one of our Bookseekers had already submitted two reviews. We enjoyed looking at these – so well done Conor, you did a great job and you will receive your first prize soon. Remember that this is the last time that we will be meeting in the library but we look forward to catching up with what you have been reading through the club. 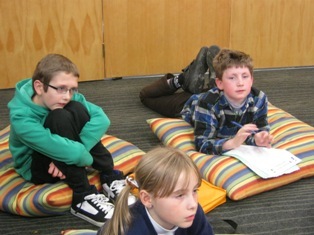 New online book club for kids! Introducing Kids’ Club, a way for you to win prizes just by reviewing books! 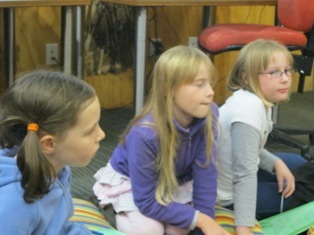 Starting today (August 1st), Kids’ Club will replace BookBusters and BookSeekers, which means there will no longer be monthly book club meetings in the library. Instead all your great reviews can go here, on the Kids’ Blog, for everyone to see and comment on. Best of all, you’ll get prizes for your reviews too. 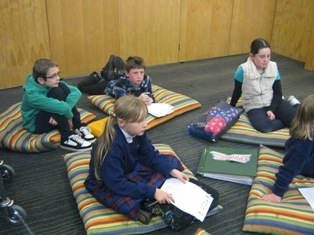 Check out the club info here, or start reviewing books straight away here. 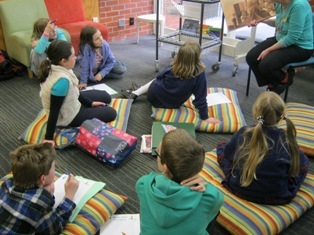 Kids’ Club is open to all 5-12 year olds that have a Wellington City Libraries membership. You can start reviewing books right now! We had a very mysteriously filled time at the Tawa Bookseekers this month as we looked at our theme for the month which was mysteries, while we also enjoying having our mid-year party. 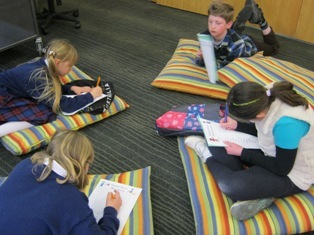 We looked at the book The Jewel Fish of Karnak by Graeme Base which has a very puzzling mystery that you have to solve by looking for the clues throughout the book. 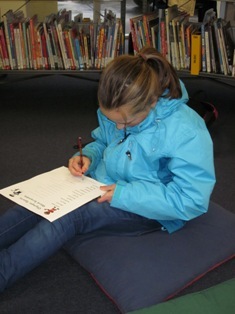 If you are finding it a bit tricky you can go online to get clues to help you solve the mystery. 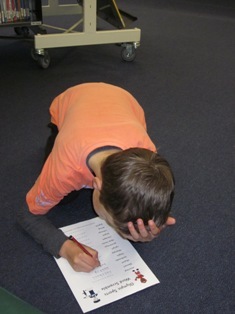 We also had some fun mystery word pictures to solve and then we were all blindfolded and had to work out some strange mystery objects by touch. With the great reviews and yummy food we all had a great time. The wait is almost over! 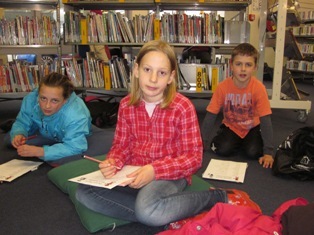 BookSeekers, our fun free club for 9-12 year olds, is on next week. We had a Mysterious May session this month! 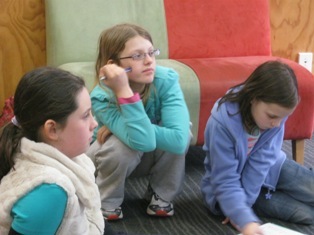 We welcomed Lydia as a new member and had a great time with the whole BookSeekers group. 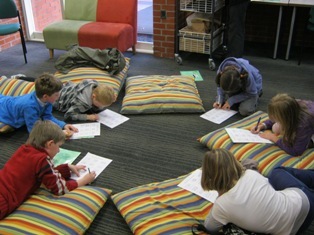 BookSeekers detectives spied our Libraries’ KIDS website and solved the enigmas of a secret quiz! 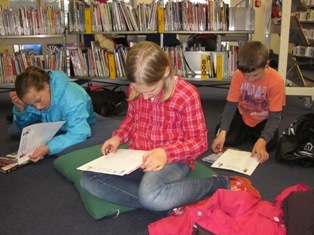 We looked at Mystery themed books in our libraries. 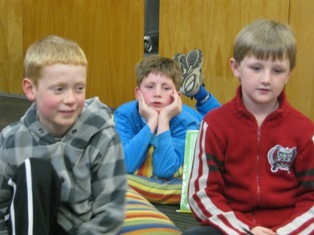 We discussed the Mystery genre : What do Mystery books have in common? How can we guess from the cover whether it is a mystery book? Then each of us picked up 3 cards from the Cluedo game : a character, a weapon and a place of murder and we invented a Mystery story. It was a wonderfully creative and inspirational moment. BookSeekers reviewed some Mystery books too : Tess gave 10 Stars out of 10 for The Cry of the Icemark by Stuart Hill; David gave 4 Stars out of 5 for The London Eye Mystery by Siobhan David and Alexandra gave 9 stars out of 10 for The Mysterious Benedict Society by Trenton Lee Stewart. They recommended their books for kids who like Mysteries and explained they were good books because each page surprises the reader about what is happening. BookSeekers’ theme next month will be books about art. Children’s picture books and sophisticated picture books sometimes challenge your thinking changing an original painting and including it in a story. We are sure you will enjoy discovering how much fun it is! Don’t miss it! 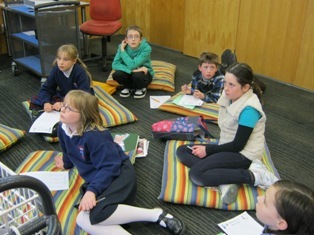 Our next meeting is June 14th, 2012 4 -5pm Kilbirnie Library. 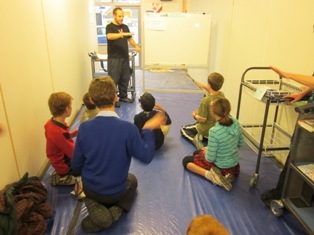 We celebrated New Zealand Sign Language at our BookSeekers meeting this month – so much fun! 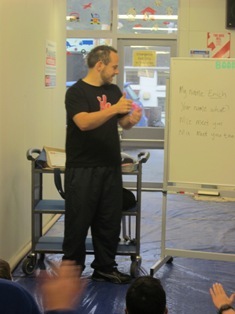 We were very lucky to have Erich from the New Zealand Deaf Association come along to teach us some simple sign language that we can use everyday. 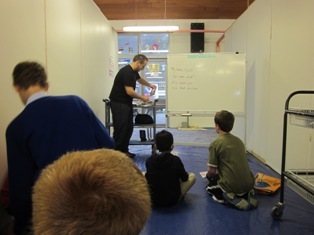 Besides learning some basic signs like hello, thank-you, what and where, we also learnt to finger spell our own names. If you would like to learn how to finger spell check out the NZ Deaf Association for some great instructions. We finished up with a game of hang-man but with a difference. We had to finger spell our letters so there was no talking. I pretty hard task at times but we had a lot of fun trying. Come along to our next meeting: Thursday 14th June at 4pm.